We had the chance and pleasure to catch up with Andrea Le Vot, CEO Europe at BlueFox about a topic they know all about. So we are glad to bring you expert advice about digital signage content. Take in these pearls of wisdom and adjust or plan your content strategy accordingly. BlueFox was created at the end of 2006 by Guillaume de La Tour and is headquartered in France with offices in the Netherlands and the US. 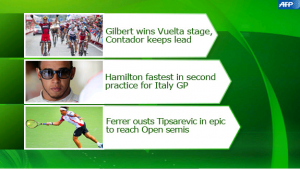 We are the expert content provider for digital out-of-home screens, delivering fresh dynamic content every day in 22 languages to more than 50,000 screens, reaching about 22 million people worldwide. Our catalogue offers all the content you need to support the communication goal of any network. 2) On your website you mention three characteristics of effective content for digital signage: attractive, regularly updated and diversified. Could you further develop this idea? What makes content attractive? Good content needs to be eye-catching without being intrusive. It should be a pleasure to watch. The update frequency has to be in line with how frequently viewers are exposed to your screens. Content like news should be updated as often as possible to be relevant. We propose an update every 15 minutes. You should carefully choose what content you show on your screens. It needs to support the communication goal you are aiming for and be relevant to your target group. Also the layout has to be adapted to your audience; one weather forecast is not like the other, form and layout play a big role. That’s why we are proposing custom templates to adapt the look and feel of the screen to your environment and brand. 3) What do you consider to be the most common mistakes people make when it comes to content? The technical aspect is often given so much importance that content gets a bit overlooked. Network owners spend their budget on the newest screen, player and software and then have almost no budget left for effective content. That’s a pity, because at the end they realise that content is still king. In my view, the communication strategy defines the content and the technology employed. Defining the content aspect of the strategy should be the first step of the project. This would also help one reduce costs and maximise the return on investment. 4) Could you give us an example of a well- designed content strategy for digital signage? What were the factors that led to its success? The better you know your target group and your communication objective, the more efficient your strategy will be. We were asked by Citibank in Dubai to supply content for their new kiosk installed near the Emirates business lounge in the new Terminal 3 of Dubai Airport. They had a beautiful and technically powerful kiosk solution to sell their banking product in a prestigious location. But the problem was that their target group- the business travelers coming along- weren’t stopping at the kiosk but were heading straight towards the business lounge, preventing the two employees from effectively promote the Citibank products. Our task was to make the audience stop in front of the videowall, so that the employees could have the chance to approach them. So we brought eye-catching and relevant content on that screen such as 3D flight over world weather, eye-catching sports videos and other relevant content for the target group. The result was an increase of sales of 20%. 5) What type of content works best in different environments (with low and high dwell times, for example)? Environments with low dwell times demand for a fast rhythm, short loop content. Visuals need to capture the attention of the audience quickly, long texts should be avoided. And don’t overload your loop, reduce it to the essential, otherwise your public will miss the message. In environments where people spend more time, you should be able to tell a story and not just aligning content elements. Make sure to capture their attention and to keep it so that waiting won’t be a painstaking experience. If you have a mixed solutions with informative/entertaining content +advertising let people know what’s coming up next to keep their interest. 6) If you were to give three advices to someone deploying a digital signage system what would those be? 1. Define your communication strategy well; this should drive your technology and content choices. 2. Know your target group well for a more efficient communication strategy. 3. Digital Signage is just a piece of the puzzle; make sure it fits into your overall communication strategy. 7) Any opinions on the digital signage industry? One market trend that we are observing is that more and more small and medium size businesses install digital signage systems to communicate with their clients, employees etc. In the future, building and managing a small network will be an easy plug and play of players. BlueFox reacts to this democratisation of digital signage by giving people access to premium content. We are currently creating an online shop for small and medium businesses, where they can buy content ready to play. I believe that BlueFox and Dynamax share the view that Digital Signage should be simple to use, easy to deploy, cost effective and flexible, and what counts for the software, also counts for the content. To learn more about digital signage, download our white paper by clicking on the image below. 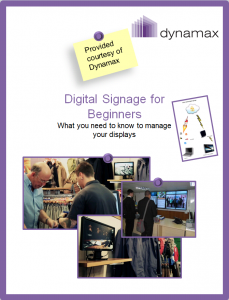 This entry was posted in Interviews, Tips and advice and tagged digital signage content by Dynamax. Bookmark the permalink.